Thread Veins Removal - 7 Things You Need to Know! Thread Veins Removal – 7 Things You Need to Know! Thread veins can appear anywhere on the body including the face and legs. Those with thread veins, especially on the face, often become self conscious of their looks. Although the causes are unknown, thread veins may be related to hormones, temperature changes, standing for great lengths of time, and alcohol intake. These veins are also thought to be a genetic condition. There are various methods for thread veins removal. Whether sclerotherapy is the chosen treatment or laser removal is, there are a number of ways to remove vein threads. However, there are important facts that should be known before deciding which avenue of treatment is preferred. 1. Sclerotherapy, a process of injecting medication into the veins to dissolve them, is a promising treatment for thread veins on legs. However, it is not the usual method for facial thread veins. 2. Some possible side effects of sclerotherapy include inflammation from trapped blood in the vein which will disappear with heat application and aspirin, bruising or redness at injection site, and brownish lines around treated vessels which disappear after a few days as well. 3. 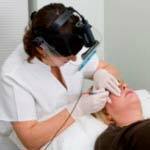 Laser removal of thread veins on face can take up to five sessions before the desired results are attained. 4. Since laser removal of veins is a non invasive procedure, the risks from the procedure are minimal to none. 5. Side effects of laser therapy include redness and swelling to last a few days, discoloration of skin for up to 2 months, and burns if procedure is not done properly. 6. Choose a reputable group or doctor to perform the treatment for thread veins removal. There will be less chance of complications with any form of treatment if an experienced specialist is performing the procedure. 7. The type of professional to choose for thread veins removal is a phlebologist, vascular doctor or surgeon, interventional radiologist, or a specialized dermatologist.